Synglitiki “Tita” Zervos comes to the United States in 1961 imagining she’ll live in the White House or a Hollywood mansion. From her tiny island of Kalymnos off the Southern coast of Greece (population 1,500), it seems possible. Based on American movies, her impression of the United States is all presidents and movie stars. Little does she know what lies ahead: a life full of cooking, family, and later – memories. 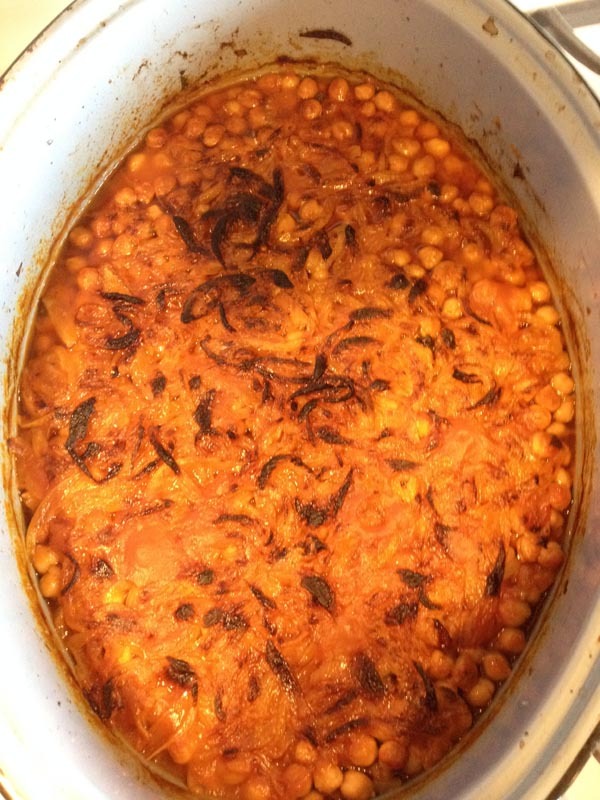 Note from Alan Lake: A Lenten staple that Yiayia calls her island’s best meal (besides whole roasted lamb), these baked garbanzos Kalymnia style were traditionally prepared by each family and then brought to the bakery to be cooked in their oven overnight (for a small fee). After church the next morning, the families would return to pick them up. Same for the lambs. 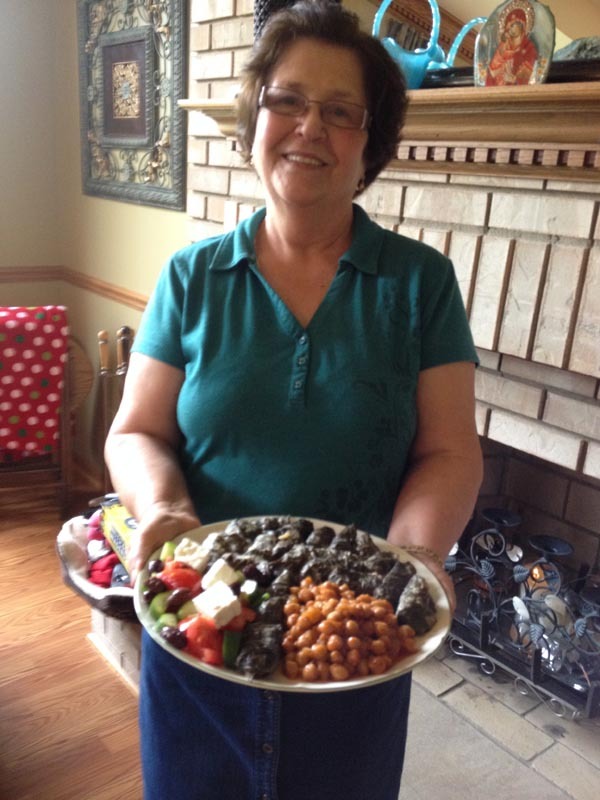 With her caveat “If I forgot something, it’s not because I don’t want you to know… I forget,” I watched and documented Yiayia’s recipes to the best of my abilities. 1. Rinse and drain garbanzos in a colander until liquid runs clear. 2. In a 6-quart pot, combine 2 oz. oil, chopped onion and chopped garlic. Stir over high heat until onions start to brown. 3. 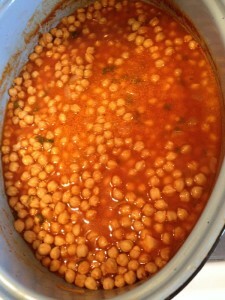 Add garbanzos, tomato sauce, tomato paste, parsley, garlic, rosemary, crumbled bouillon cubes and pepper. 4. Mix well. Bring to a boil and reduce to simmer for 1 hour. 4. Remove from pot and place in thick metal roasting pan. Preheat oven 375 degrees. 5. Cook the onions that top the dish. Heat olive oil in a heavy bottomed sauce pan. Brown the 3 lbs. 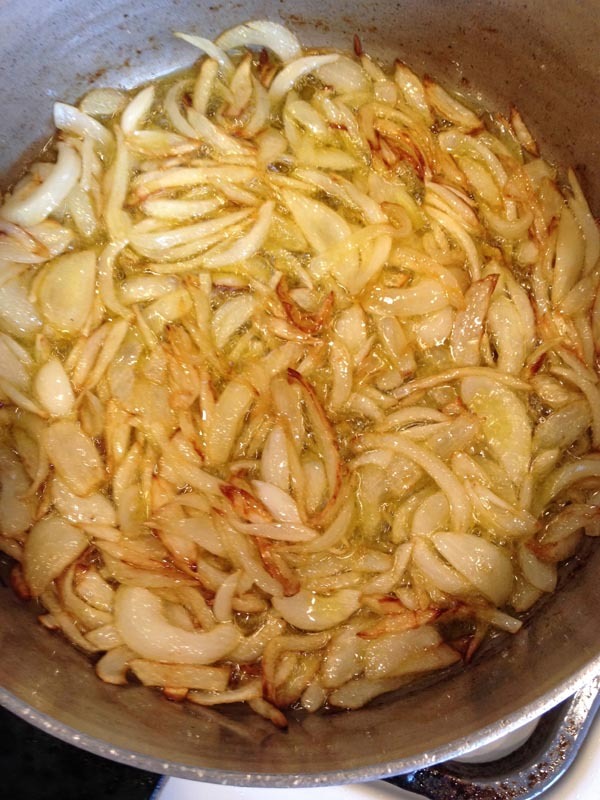 of sliced onions in the oil and distribute on top of the garbanzos. Do not mix. Yiayia used most of the oil as well – about a cup’s worth. Place on top. 6. Bake for 1 hour covered. 7. Remove cover and turn oven onto broiler setting. Place under broiler to allow onions to crisp up a bit (a couple of minutes maybe). You need to watch this carefully; do not walk away. 8. This makes a great side dish or main course. Serve with a salad of cucumber, onion, feta, and olives drizzled with some red vinegar, good olive oil and salt and pepper to taste. Warm pita bread is nice as well.